Question: Can we collect advanced/ deposit payments through an existing Job in JGID? 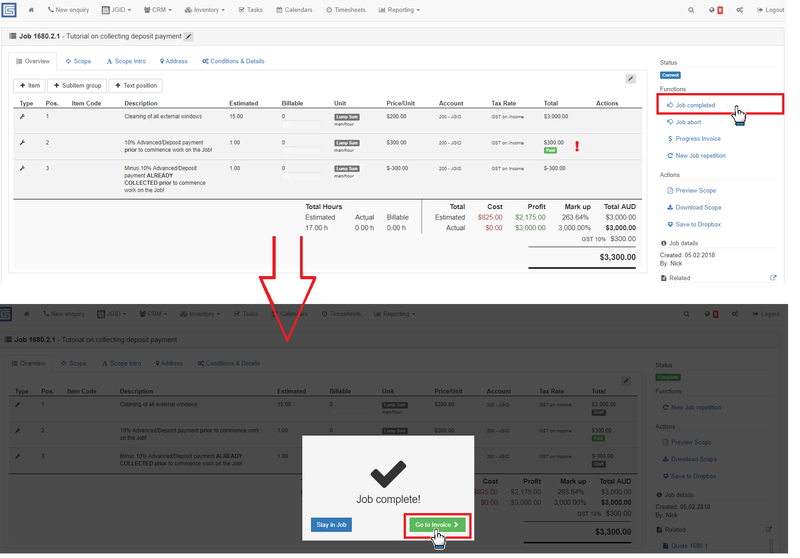 Answer: The solution in this case is to use the progress invoice feature from the Job management column at the right side of the screen. If it is a deposit you have to collect, then you add one item with the value of the sum you want to receive prior to starting the job and one another item with the same value, only this time it has to be with a “minus -” symbol added to its sale price field. This is done in order to balance the original value of the job. First you will progress the payment for the 10% deposit item. Later, when the job is complete and you proceed with invoicing the rest of it, you will then have an invoice for all items that have not been progress invoiced YET, including the item with the minus value to reconcile for the advanced deposit which has already been collected. Essentially you will end having two invoices for the job – one for the progressed deposit payment and one for the rest of the items minus the value of the collected deposit.